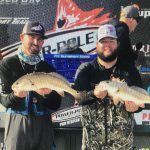 As tournament anglers that travel all over the State fishing the Florida Pro Series, we are always on the search for something that will give us a competitive edge over the other anglers. In that search, we came across ISLA Mapping and Florida Marine Tracks (FMT). We have been using FMT for a few years now and it has provided us with local navigation knowledge that gives us an edge when we to travel to new and challenging areas that we are less familiar with. When we fish tournaments that are outside our local waters, we can use FMT to show us the best routes and shortcuts and we also use it to scout areas quickly. We find it very useful in unsafe and challenging conditions like heavy rain and fog when visibility is poor and also at night. We used it very successfully at Steinhatchee with heavy fog all day and FMT got us out and back to the ramp safely. Not only did we find FMT extremely easy to use, but the colored tracks on the display make distinguishing between low tide and high tide tracks very easy! We also use it in our home waters to find faster and safer routes, to scout new areas, and to locate deep holes that may hold fish. We definitely recommend FMT to all inshore boaters because as it allows running into places outside your comfort zone without worry or any engine or boat damage. I have been using the FMT Florida chip for a little over a year and am pleasantly surprised with the great improvement in navigation that the chip provides. 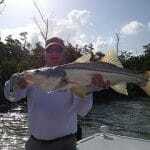 I primarily operate in Everglades National Park and the navigation routes are spot on. The Everglades can be a challenging shallow water environment, especially in the winter with the extreme negative tides. It is always a challenge running where I like to fish but I am confident when running FMT navigating these difficult areas and FMT has never let me down. I also like the fact that, although the U.S. Coast Guard is removing their aids to navigation in the Park because they do not have funding to maintain them, that the FMT chip has added value because it will display where the markers were formerly located, helping me navigate in less than ideal conditions. Recently, I found myself in the Merritt Island Wildlife Refuge without a chart and I inserted my FMT chip and not only found navigation routes but also, with the imagery, I could locate grass flats and pot holes which opened up the trout and redfish habitat. Thus, the chip can provide information not only for navigation but can locate prime fishing hotspots. I’ve used other navigation and fishing chips, but nothing compares to FMT. I’ve been fishing out of Flamingo at Everglades National Park for more than 30 years and many of those were as a guide. I learned the place the hard way over a long time, burning lots of gas and exploring so many of the seemingly endless creeks or mangroves. Based on my experience running with and without FMT, I have found that Florida Marine Tracks provides navigation insight that for decades was closely guarded information. Virtually all of the tracks that I ran and counted on for years are noted on the map and they enable me to run from the boat ramp to the gulf protected from the 20- to 25-knot winds that normally would keep anglers from going fishing. And I like the fact that the map has details that are important to me, such as easy-to-see tracks, accurate marker and post locations, shortcuts, and even on the water campsites “Chickees.” The average guy will tell you that navigating around S. FL shouldn’t be that hard to do with a good map/chart GPS. Well, I for one can tell you that I’ve run many different navigation plotters with different maps and they all show me running on dry land when I am really running in a channel or creek and if they have photos, they are really poor photos that I couldn’t begin to try to interpret for most navigating purposes. No other mapping company has clear hi-res imagery like FMT and no other has taken the time to document navigation to such detail as FMT either. It is very helpful in poor visibility conditions such as if you happen to be running in heavy rain, at night, in dense fog, or before sun up. If you pay attention and use FMT properly, you can have confidence you will not run aground. And I like the fact that it helps protect the environment and also provides me some added insurance against the risk of losing a lower unit. Down here where I run, you can run over an island that was washed away years ago by natural erosion or by a hurricane and somehow FMT has incorporated all of that track insight. I think everyone running around the Everglades could benefit from a Florida Marine Tracks chip. The FMT chip has enabled me to run areas that are new to me with the same level of confidence as I have when I’m in my home waters of Everglades National Park. It includes routes for Florida Bay, Whitewater Bay, and the other Bays on the interior waterways of Everglades National Park. FMT provides the missing piece to the Florida Keys navigation puzzle that so many boaters have been seeking for years. I am glad it is now finally available. I have had the distinct pleasure of working with Glenn on some of the track development, and the level of detail goes well beyond the expectations of even the most seasoned shallow water enthusiast. We have grounded the boats on more than one occasion in efforts to achieve a full understanding of the nuances of water depth, sandbars, channel markers, and to provide a safe passage to desired flats or channels where channel markers are supposed to be, but have long since deteriorated or moved over time. It really provides an extremely high level of confidence in the tracks that are positioned in very dicey areas, where no sensible person would venture without excellent local knowledge of the waters. There are plenty of tracks that venture through winding channels, that if one looks 20 feet to either side of the boat, one realizes that the depth of water at dead low tide is about 4 inches. 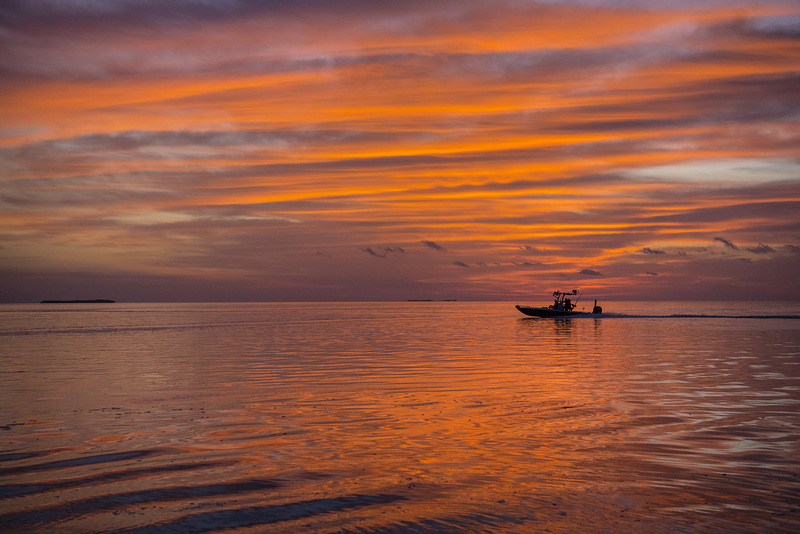 The tracks are so accurate that one can navigate at planing speeds through these very treacherous areas of The Keys with full confidence that if you are on the track, no matter the tide, a flats bay boat will navigate these very shallow waters in a safe manner. Additionally, the tracks are so comprehensive, that the ability to set route options for destinations depending on tide, weather, or timing issues provides limitless options. There have been times when I have had to choose alternative routes based on weather conditions, and having a comprehensive menu of routes to choose from, makes one truly appreciate the system. I bring this up, thinking back on a trip with Glenn to the Marquesas where a sudden very severe storm came up, producing 38-knot winds and torrential rain for hours. Having to navigate back to Summerland Key through the islands in the narrowest of channels at low tide to avoid the heavy weather waters, the FMT system gave a complete confidence booster and level of assurance that all would be well. I can’t express enough how much detail is provided in the FMT system, providing nuances in the imagery which is unparalleled in any existing navigation software. I have been using the FMT chip for 14 months now. I was introduced to this software down in The Keys during a Marquesas fishing trip. I can say since I’ve spent my hard-earned money on this product that there is no other product that I have ever seen that comes close to its detail of mapping and navigation aids. With that said, during that outing to the Marquesas, we left from Summerland Key and drove oceanside down to Key West Harbor then out to the Marquesas a very long trip via boat. Since I was never there before, it was virgin territory to me. Seeing is believing what’s on the screen in front of you as you run. But as the day was winding down, we made our way back to Key West Harbor thinking we were heading back but we stopped to fish into the night for Tarpon. So here we were at 10 pm, pitch black and our only navigation was the FMT chip to get us back up to Summerland Key in pitch black under the stars. Since I have never done this before and the areas are extremely shallow along the way, we made our way back safely thru the narrows which doesn’t have much room for error even in the day time without hitting or running aground. That a true testament to how accurate these maps and tracks are. I also fish over in the Ten Thousand Islands area for years and have not ventured into certain areas due to lack of knowledge. With the FMT chip I now have the confidence and am able to explore and fish a whole new world of the Everglades Park I never knew. Do yourself a favor and purchase this product. It’s the best map investment you’ll ever make. I’d like to give a shout out to you and your team for such a great job on your Florida Marine Track navigation chip. 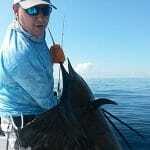 We have been fishing the lower Keys out of Lower Sugarloaf Sound for the past several years. 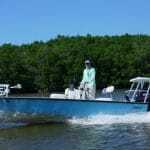 Each year we have been limited to predominately trips into the Atlantic along the well marked channels coming out into, and out of, Tarpon Creek. But as all Keys guides and a lot of recreational fisherman know, due to wind and weather conditions, some days it is a much safer and easier trip into the gulf. We have had some harrowing adventures more than once as we had no safe existing tracks or routes, and we were constantly having to slow down, change routes, stop, and sometimes even run out of water in the extremely skinny waters of the back country. Getting into Marvin, Snipe, the Contents or even Johnston Channel was a challenging, white knuckle ride at best, and walking, dragging and pushing the boat out at other times. So, this year with our new Navico B&G 12 touch, and your FMT chip, we navigated back there like we actually knew what we were doing. Pick the location you want to go to, follow an FMT track, and go right to that location, on plane, and safely. We spent less time getting to our spots and getting back and more time actually fishing. We still watched the water depth and had to dodge the crab/lobster traps, but we learned to trust every track we chose to follow. Even in the “use caution” areas and running in 1′ of water, we had no issues. Markers seem to be perfectly placed, and our 22′ Pathfinder 2200V with a jackplate and a 150 VMax never touched bottom. The photos are incredibly detailed and a great aid to navigating the endless mangroves and islands. Thanks again for a great product, and I highly recommend this incredible navigation chip, derived from years of personal exploration, to all boaters. I have owned my FMT chip for about 8 months and I am completely impressed every time I use it. The quality of the imagery is in a different league from others I have used, and the precision of the navigational markers is amazing – especially in Everglades National Park, as they have all been moved and corrected (even the stakes are shown). FMT has allowed me access into areas I could never have gotten into any other way. 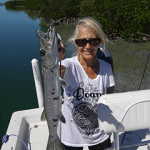 A quick example – I was fishing a tiny creek near Boca Grande, and the water was very dark – so dark that you could not tell when you were in the channel or out of it – which was about 6 inches deep. The only way I navigated into it and out was by using the satellite imagery on the FMT chip – without it there would have been no way I possibly could have made it in. The price is not inexpensive, but considering the amount of time that was put into it and the quality of what you are getting versus others – it is quite reasonably priced. If you ever want to fish other areas than those that you know well – it is an invaluable tool – there is really nothing quite like it. I had two Garmin units that I liked over the last six years on my boats. This year, I’ve let Hell’s Bay Boatworks build my “dream skiff”: a custom Marquesa. I’ve spend months thinking about what’s the best setup for my new skiff. I’ve tested every GPS unit at Westmarine over and over until I decided to go with the Simrad GO7. I hated the built-in Simrad map but thought that I would be fine with the Navionics Platinum Plus card fishing from Tampa Bay to the Everglades. I found out pretty soon after testing the Platinum Plus card on the water that my iPhone with Google maps was better to navigate than the Navionics card. In a lot of areas where I was running my boat, the Navionics card pictures were blurry and I did not really feel safe because the details and map info were way off in many areas! Bummer! I’m glad my fishing buddy told me about the Florida Marine Tracks cards. It is a game changer! I have finally found in FMT exactly what I wanted: perfect images on my Simrad unit and accurate tracks! It looks like Google Maps but with navigation tracks. It’s priceless to be able to navigate safely in areas on the water where you have never been before. I highly recommend getting a FMT card. My Simrad GPS unit only became as good after I added the FMT map and I’m very happy about my setup. 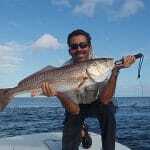 ISLA has a product that has revolutionized the way people fish in the Florida region. I fish with a guy that has been fishing out of Chokoloskee since the 80's. I won't say his name, but a lot of his lines are on the FMT chip in the choko region. These aren't one of those arguments where you win if you've fished a region longer than me. I don't care if you think you know how to read water or you think you know where a sandbar or oyster bar is or if you say you've been fishing here since I've been sucking on my thumb. If you run this chip it will change the way you fish the everglades, no debate..... When you plug in the chip and see what it is, if your not 100% impressed please message me and I'll buy your chip back at full price and re sell it. It's saved the bottom of my boat and has put me on prized fish time and time again. I'm baffled its not a standard feature on every MBG produced boat, and I am no way affiliated with ISLA. I get nothing of expressing my opinion on this chart. There's nothing like running into Lostmans south entrance, seeing a few beached boats on a -0.5. You just run right by them, and at that moment you know you made the right choice running FMT. My FMT is worth every freaking penny so far. When my other Lowrance kicked the bucket on my way down to the Key Largo Mini Rally, I decided it was time to buy a HDS7 and buy the FMT chart cards because Navionics was so horrible. Seriously, my navionics cards on my other boats say there's a channel marker supposed to be there, but...nothing...and don't even get me started on sandbars. I have been running the pre-mapped tracks on FMT since the beginning of July, and have not hit bottom once! HAHA! Seriously, though, I've been going to places I've never been, running more shallow than I ever have in my life, and no issues yet...which, I think is pretty damn amazing... Here is a very zoomed out view of Flamingo area and all the safe routes to run that are 1ft deep or better, and the imagery just gets better and better when you zoom in. All of these routes were ran by FMT, and every marker was checked to be in its exact location...even sticks marking channels. FMT is the most accurate and up to date satellite imagery available to FL boaters. I own a Navionics Platinum chip and it's satellite imagery is outdated junk compared to the FMT. Yes I’m very happy with the FMT Chip. Definitely helps the learning curve and extremely nice to have when you go to new places. I highly recommend it. I also got the FMT chip and am extremely happy with it. I don't fish the keys that much, but was down for a week and that chip made things so easy.........just gives you tons of information at your fingertips and the confidence to know where you are going in unfamiliar places. I bought the early release for S. Florida because the Keys section was done, and to tell the truth, it was so good, I wasn't even going to get it updated (for free by the way for the early release version). But after I talked with them I was convinced to send it back for the update. They made some more improvements to the Keys section as well as finishing up the northern section.Turnaround time was 4 work days from mailing. The overlay photography just blows everything else away. It doesn't take long to get used to all the options either. I've got mine on a Simrad 12 which has a fast processor and a quick scrolling/selector knob. There are a huge number of options for the overlays, but that's what I like, so I can get rid of the clutter I don't need at the time, but have quick access to it if and when I do want it. And it's not like you to have to re-set it every trip anyhow unless you want to change something from the last setup.Those tracks in the screenshots posted above narrow way down as you zoom in so during normal use they are visable, but not distracting in the least. And if you don't want them - just turn them off. With his chip, the only things that show are what you want to show. It ain't like the Garmin chip when every time you move the view you get an annoying banner telling you all about the everglades that you can't shut off.The better the GPS the better the imagery, and it is really, really good. I have used my new card for two days now in a row. Very impressed. It's right on the money. I can see a hole and then watch my depth finder drop. Unbelievable. I can see everything. Thanks. Well worth the money. Navionics is better than Garmin but the FMT charting and imagery is by far the best hands down for FL.